Dazzling fireworks or a spectacular light show? A leisurely cruise on an abra or dancing in one of the most happening parties in the world? 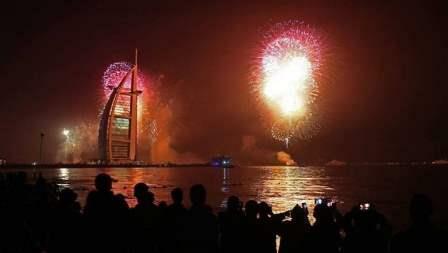 If you are in the UAE for New Year's Eve, you are simply spoilt for choice on how to celebrate. You could ring in 2018 in the shadow of the tallest building in the world, Burj Khalifa, with a record-breaking light show, or you could blast into the new year with fireworks displays in Abu Dhabi, Dubai, Sharjah and even Ras Al Khaimah. The authorities have put in place a robust plan to ensure safety as you indulge in revelries. In Dubai, some roads will be closed, a Metro station will be shut and separate routes have been specified for bachelors and families to get to Downtown Dubai. Similar steps are in place in other places, too. Yes, it's going to be a bigger, better and safer New Year's Eve. Replacing the much-anticipated fireworks, the Burj Khalifa will be having a special light show to ring in 2018. The 'light Up 2018' celebrations will kick off at 5pm starting with the Dubai Fountain shows and live music. With the Burj Al Arab as its neighbour, Dubai's beach stretch is unsurprisingly packed with NYE revellers. Of course, it's best to get there early - pack a picnic basket and blanket and perhaps get there in time to catch the sunset before settling in. The untouched stretch of sand behind Knowledge village offers unsurpassed views of the Burj Al Arab and the fireworks. From this spot, you'll also be able to see dazzling fireworks explode over the Atlantis. Dubai's modern take on a traditional souq is located right next to the Burj Al Arab, with restaurants, lounges and plenty of open spaces from where you can take in the show. The sought-after spot offers a panoramic view of the fireworks from the beach. Is there a better way to view the fireworks than from the source itself? book yourself into the Atlantis resort or grab a table at the New Year's eve royal Gala and you will have front-row access to the mesmerising fireworks. Ras Al Khaimah's Al Marjan island will attempt a Guinness World record for the 'largest aerial firework shell'. Why not head down there and be part of history as it is made? over 5,000 additional parking spaces will be available around Al Marjan island. Sharjah's Al Majaz Waterfront will ring in 2018 with a 10-minute-long fireworks display launched from 16 aligned massive barges on New Year's eve. This means you will be able to see the fireworks from any spot around the Sharjah Corniche. Yas island will welcome 2018 with a spectacular fireworks display at du Forum's 'Winterland carnival', along with Katy Perry's live concert. The Grammy-nominated singer's performance will be the pinnacle of winter festivities taking place on the island.